13th match of 2015 ICC Cricket Worldcup has been played between India and South Africa at University Oval, Dunedin today. India put huge score of 307 runs with S Dhawan 137 runs and AM Rahane's quick 79 runs of 60 balls. South Africa could not hold the nerves well and all out scoring 177 runs in 40.2 overs and lost the match by huge margins of 130 runs. S Dhawan (India) got man of the matchfor his 137 runs. Earlier, India won the toss and decided to bat first and set target for South Africa. India could not made batter start and lost RG Sharma unfortunately run out for a duck. 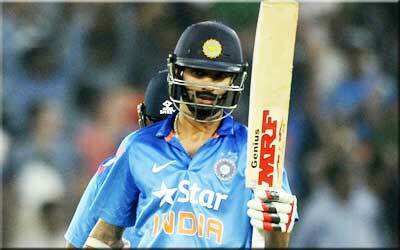 Virat Kohli joined with S dhawan and played sensible cricket for India. He made 46 runs before he got out. S Dhawan played splendid inning of 137 runs joined with AM Rahane who made 79 runs before left the field. India managed to put huge score of 307 runs at the end of 50 overs. Following huge target of 308 runs, South Africa could not made batter start and lost Q de Kock early scoring 7 runs. F de Plessis played good inning of 55 runs but, other middle order and lower batsmen could not perform well and South Africa all out scoring just 177 runs in 40.2 overs and lost the match by huge margins of 130 runs.